Hey peeps. 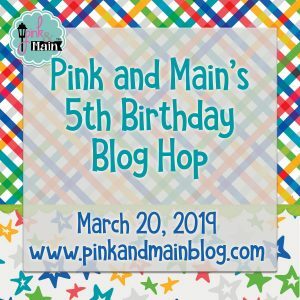 Today we are celebrating Pink and Main’s 5th Birthday Blog Hop. I’m so excited for everyone today. Pink and Main has been one of my favorite stamp companies since Michelle started. She is an incredible woman and she has made Pink and Main one of the go to places for beautiful stamps, dies, paper and embellishments. We have some amazing and talented people on this hop and I’m sure you’re going to be blown away with so much inspiration. 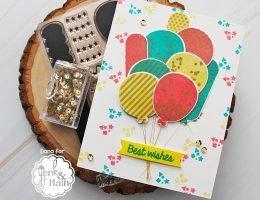 For my card today I’m using the Party Balloons stamp and coordinating die cuts. I’ve also pulled in a sentiment from the Sweet Bouquet stamp set. 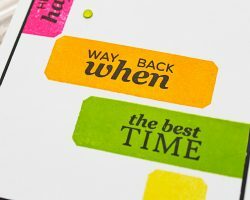 To create my card, I pulled out a variety of inks and stamped out fun confetti onto a white card base. I used the same inks to stamp out each balloon. Stamping the coordinating design on each one with gold ink makes the balloon shine. Next I die cut out each balloon and added some gold thread to the bottoms of each one. Stacking the balloons one on top of the other leaving space for each one to be seen give me my focal point. The last two balloons I added just a bit of foam tape to pop them up. Are you ready now to hop around for more excitement? It’s time to take a scroll along the hop to these very talented crafters. Make sure to leave them some love along the way. 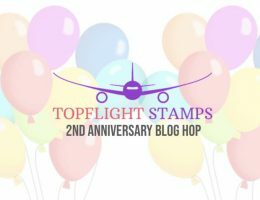 There will be FIVE random winners from this blog hop. Each winner will receive a $50 store credit to Pink and Main. Comment by March 24, 2019 and Michelle will pick a winner on the blog March 25 2019. Thanks for stopping by today. Next on the hop is CALY. Enjoy your day everyone. 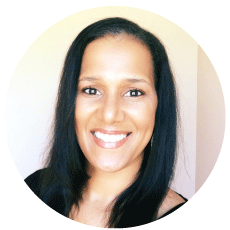 « Watercolor Summit Course – I’m I Ready For This? Love the soft colors of your balloons. what a beautiful balloon bouquet. I love the addition of the gold. I really like the bright colors you used for your confetti background and your Fab balloons! The gold on top really makes the balloons POP! So fun for a fifth birthday celebration ! Simple, yet gorgeous card! Love what you’ve done with it! The confetti in the background is nice. The balloons are decorated so cutely. Nice job. What a beautiful card, very fun and festive. Thanks for sharing with us. I like how the balloons stick up. Someone is going to love to get your card. Very simple and beautiful card! tfs! Earlier I thought I commented but don’t see it so I will try to recreate what I said before: I really like the gold confetti on the balloons because it makes it look like those super expensive and unique balloons! Really makes them pop! (hahaha) and I also am fond of the confetti in the background! A super great card for a fifth birthday celebration! Lovely card!!! Love all the balloons!! What a great card! So much fun. Love the clean crisp look of your project card. Excellent! And your presentation is outstanding also. Love this bouquet of colorful balloons. Great card! I love the gold accents!!! Really like your balloons and how the pop off the page! Very beautiful card. Love the gorgeous balloons and the background looks amazing! Very pretty ! I love the colors! Love how you decorated each balloon! Great card! Such a pretty birthday card, Dana! Love the colorful balloons. So fun! Great colors! I love this release! I love this card, clean yet colorful and fun, very nice! The bright confetti background really makes it look like a fun party card. Wow! 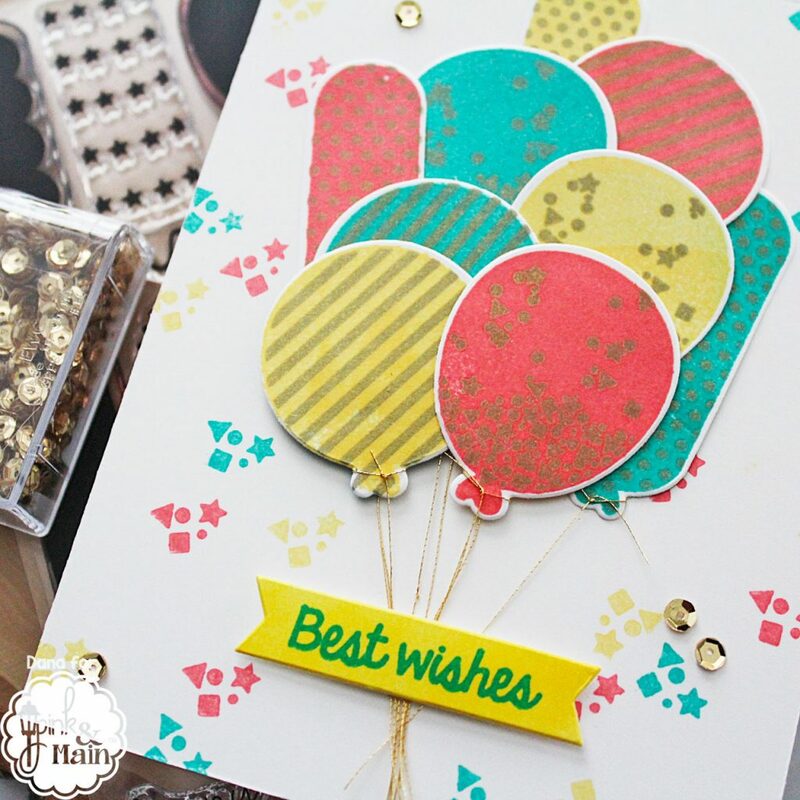 Love your card and how you coordinated the stamped backgrounds with the balloons. The gold accents on the balloons are perfect. Very cute and bright birthday card! Fun seeing this fabulous project. Love the festive balloons! Great colors! What a happy card, I love it. I smile every time I see balloons! Must be a leftover from childhood eh? 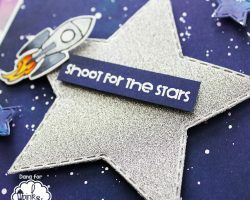 Cute new products! Fun-filled card. Love all of the gold. A beautiful happy card Dana. Wonderful release from Pink and Main. Such a fun and colorful birthday card! I love the added designs on the balloons, and how you used the gold thread for the strings to match. Fun confetti background! Fun cute card, Thanks for sharing. What a festive birthday card! I love the colors!! 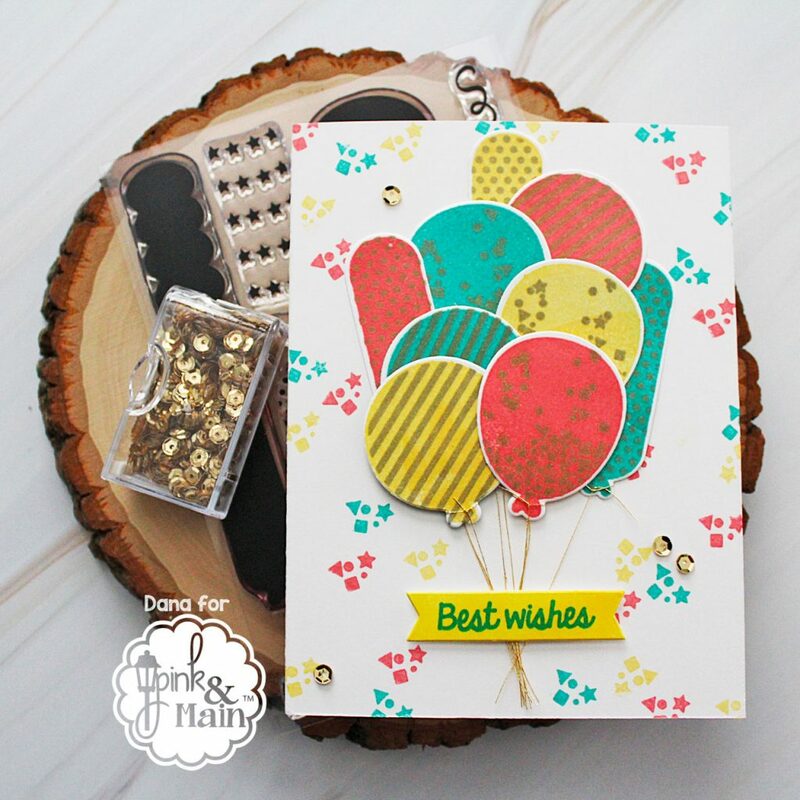 Vèry fun background and love the colorful balloon cluster you created! What a fun and festive card! I love the colors and the way you used the gold thread for the strings! Absolutely beautiful!! I love the pretty background & balloons! Loving the details in your card. Your card is so festive and fun. Wonderful job. Thanks for sharing your creativity! The background you created is great and the balloons are so pretty – great colors ! Thanks for sharing. Love the background and wonderful designs on the balloons! The colors are great ! Thanks for sharing. 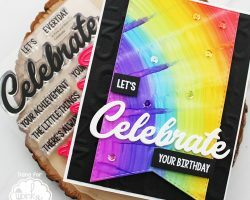 Your card so perfectly represents a celebration! So fun and happy. Love that you used the same design to create your background and carried it through onto the balloons ! The color combo is beautiful! Great background and love that it is the same design used on the balloons! Beautiful colors! Love the background that coordinates with the design on the balloons! Very pretty colors too! I swear I thought I left a comment, but I don’t see it. Oh well This is such a fun & festive card! Such a fun card, love the mix of colors. Such a fun card, love the choice of colors. I love the way you stamped the confetti on the balloons and background! I also liked the gold strings to the balloons! So cute! Thanks for sharing! The gold is a nice idea as an accent. Great job. Cheerful and gorgeous! Love the gold strings to the balloons! Beautiful! Love the pretty colors! Lovely card. The palette you’ve used is so bright and cheerful. Thanks for sharing your creativity.